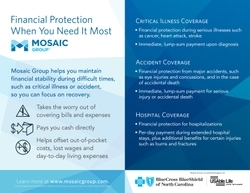 Mosaic Group, a subsidiary of BCBSNC, offers financial protection for critical illnesses like cancer, heart attacks or stroke, as well as accidents and hospital stays. Offering financial protection products at www.mosaicgroup.com gives North Carolinians a convenient way to protect themselves and their families. CHAPEL HILL, N.C. – In 2012, there were approximately 51,860 new cases of cancer in North Carolina1. And in 2010, more than 109,000 people in North Carolina were injured in car accidents2. To help North Carolinians and their families weather the financial impact of these crises, Blue Cross and Blue Shield of North Carolina (BCBSNC) is launching Mosaic Group, a BCBSNC subsidiary, that offers financial protection for critical illnesses like cancer, heart attacks or strokes, as well as accidents and hospital stays at www.mosaicgroup.com3. Critical Illness Insurance. This product protects against serious illnesses like cancer, heart attack, strokes and others. Coverage provides immediate, lump-sum payment upon diagnosis of a covered illness. Accident Insurance. This product covers accidental death, dismemberment, fractures, dislocations, burns and other major accidents. Beneficiaries receive an immediate, lump-sum payment for serious injury or accidental death. Hospital Confinement Insurance. This product covers hospital stays and provides a per-day payment during a hospital stay, plus additional benefits for certain injuries like burns and fractures. Mosaic Group expects these products to appeal to customers who have had previous experience with a loved one’s serious or terminal illness, health plans with high deductibles or those who wish to protect their finances, if an unexpected event occurs. The availability of these products through Mosaic Group offers consumers affordable financial security for unexpected events. To learn more about Mosaic Group and its product offerings, visit www.mosaicgroup.com. Blue Cross and Blue Shield of North Carolina is a leader in delivering innovative health care products, services and information to more than 3.7 million members, including approximately 900,000 served on behalf of other Blue Plans. For 78 years, the company has served its customers by offering health insurance at a competitive price and has served the people of North Carolina through support of community organizations, programs and events that promote good health. Blue Cross and Blue Shield of North Carolina was named one of the World’s Most Ethical Companies by Ethisphere Institute in 2012. Blue Cross and Blue Shield of North Carolina is an independent licensee of the Blue Cross and Blue Shield Association. Visit BCBSNC online at bcbsnc.com. Mosaic Group is an independent, full-service insurance agency owned by Blue Cross and Blue Shield of North Carolina. Mosaic Group offers a comprehensive array of coverage options to protect against life’s unexpected events. These products provide peace of mind and cash payments when customers need them most. Incorporated in 1968 as Group Insurance Services, Mosaic Group has a long history of serving North Carolinians and currently serves more than 11,000 North Carolina businesses. For 25 years, USAble Life has helped employers and benefit professionals nationwide provide benefit program that are attractive to employees, while remaining flexible and competitively prices. Recognized as one of the 50 top-performing insurance companies in the nation, USAble Life offers Group Term Life, Accidental Death and Dismemberment, and Short and Long-Term Disability programs, in addition to a suite of voluntary products.